In late June, the Russian Reconciliation Center in Syria reported that the first group of Free Syrian Army militants had joined the Syrian government’s forces to fight terrorist groups in the southern de-escalation zone. 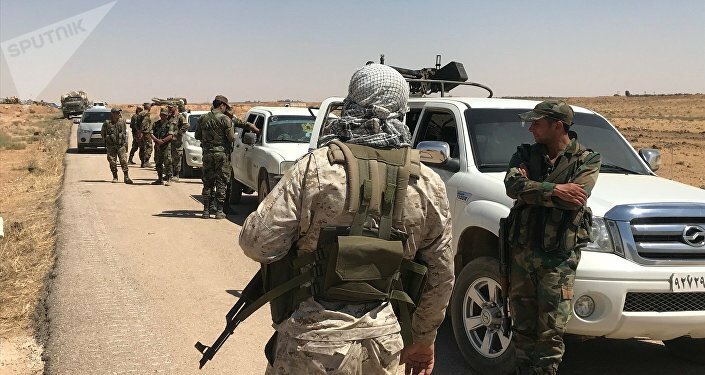 Local media reported that former militants from the Free Syria Army had sided with the Syrian Arab Army against the Daesh-affiliated* terrorists in the southern province of Daraa. A Russian field reporter has recorded the ongoing terrorist offensive, suggesting that over 500 ex-militants were currently fighting alongside government forces after the ceasefire was reached. Last month the Reconciliation Center announced that the first group of Free Syrian Army militants had joined government forces in the southern de-escalation zone. The Omari Brigades leader also added that his group would fight against al-Nusra* and Daesh alongside the Syrian Arab Army. The Syrian Army stepped up its offensive in Daraa after its capital and a number of other cities were shelled by local militants despite a ceasefire. Earlier in July, the government secured control of most of the province with the help of the Russian Reconciliation Center for Syria. Under the reconciliation deal, a group of militants agreed to surrender arms, halt hostilities and return to peaceful life, while others, who didn’t want to reconcile with the country’s authorities, would be evacuated from the province along with their families. “As a result of the talks with the leaders of armed groups in the province of Daraa, under the mediation of the Russian Center for Reconciliation, an agreement on the following issues [has been reached]: the cessation of hostilities, the beginning of the delivery of heavy and medium weapons in all settlements under the control of armed groups,” the reconciliation center stated in a July 7 report. Slightly over a week ago, a source in the security services told Sputnik that nearly 1,500 had militants left the suburbs of Daraa for Idlib in Syria’s northwest.